Today GM released power figures for the heavily-revised 2011 Chevrolet Silverado HD. Thanks to a few well-connected sources, regular GM Authority readers (and listeners) knew in advance that this was going to be a surprise. And what a shocker it was! 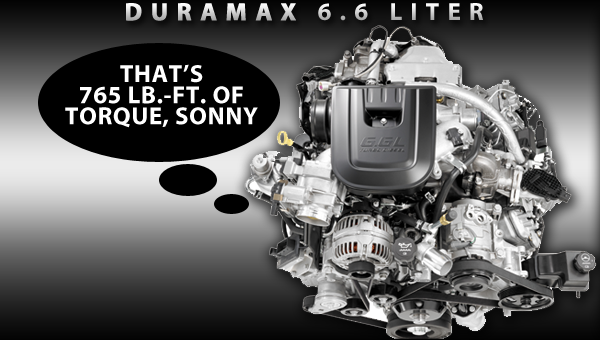 GM’s top-of-the-line 6.6-liter Duramax diesel is the most powerful heavy duty engine in its class – putting out a whopping 397 hp (296 kW) and 765 lb.-ft. (1,037 Nm) of torque! On the gasoline side of the spectrum, GM’s Vortec small-block – the standard powerplant for the Silverado HD trucks – also received some revisions for the 2011 model year. When in the 2500 and 3500 HD models, the 6.0L small-block V-8 is rated at 360 horses (268 kW) and 380 lb.-ft. (515 Nm) of torque. In chassis cab and box-delete models, as well as Silverados with a GVWR greater than 10,000 pounds, the gas engine’s horsepower rating drops to 322 horsepower (240 kW) while retaining the same torque rating. The 6-liter Vortec is further enhanced by “greater idle refinement” and achieves “excellent fuel economy” by the engine’s low-friction OHV set-up and cam phasing. Needless to say, this is GM’s small-block architecture (LS family) known for its strength, smoothness, and durability. What we haven’t mentioned is that all 2011 Silverado models are covered under the best warranty coverage in America – a five-year/100,000-mile limited powertrain warranty that includes roadside assistance and courtesy transportation, among other features.